Handshake Squad was formed in 1996 by Dave Rogers and Rob Constable, who up to that point had composed only classical music. The Squad's early activity involved many quarts of cheap malt liquor, purchasing and modifying toys to use as instruments, and hours of overdubbing on quarter-track recorders purchased at garage sales. Voices were always highly processed; the lyrics - when intelligible - almost always ridiculous. At this time Home and Studio Recording Magazine released HS's song Mary Likes the Tom Toms on their yearly CD compilation, referring to it as performance art. Upon hearing these early recordings, composer Eric Lyon asked Handshake Squad to act as the pit orchestra for his avant-garde opera series Retirement Fund [Smart Noise Records], for both the stage productions and the studio recordings. 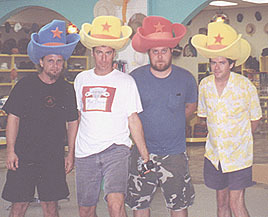 In its original formation, the quartet was unable to find time to rehearse, and so they played together only during live shows. These shows were memorable only because they were so puzzling to experience - one could never be sure of the band's intentions. This ended in a hiatus as the bass player and drummer moved to NYC, and Dave and Rob searched Tampa for players who were willing to practice and were not afraid to make complete asses of themselves. They found just that (and then some) in drummer Devon Brady and bassist Joel Brown. After only their first two rehearsals together, they joined pianist Corey Jane Holt as the chamber ensemble in Eric Lyon’s classical composition Four Last Songs. The current members of Handshake Squad have been together since 1998, and have added a 5th Beatle at the mixing board for live processing and tape/CD cues. Handshake Squad is continuously writing and learning new songs, recording and dreaming up new ways to make themselves look and sound absurd. In 1998, "The Alison Project" began. To date, Handshake Squad has written seven different songs called Alison (all with secret sub-headings) with several more forthcoming. These songs are often performed as set, and there are plans to release a CD containing them all. They also regularly perform four different songs, all entitled The Robert C. Constable Jr. Show. They have been known to shave their own heads on stage while performing. The local press has applied the terms "Tweeky Pop" and "Academic Experi-Pop" to Handshake Squad. Handshake Squad has no idea what these terms actually mean. They are easily the most misunderstood band in the Tampa Bay area. They do not bemoan this, but rather smile, enjoy and simply accept it as fact. Handshake Squad is considering forming another group which covers only Handshake Squad songs. 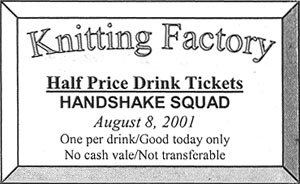 In the summer of 2001, the Squad toured the east coast playing New York's Knitting Factory and Mercury Lounge among other venues. A stop at the famous South of the Border was planned and executed. 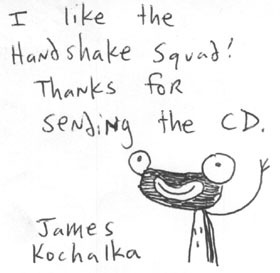 Along the way, they were introduced to the music of James Kochalka, and have been championing his music in the south east. Another tour is planned to support the new CD.